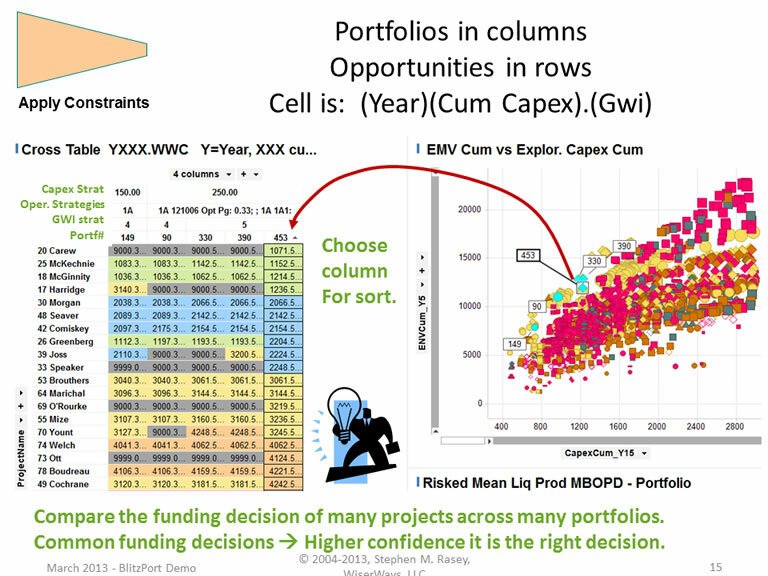 We select five portfolios (in yellow) in the NPV vs Capex Spotfire chart on the right. Managers need to know which investment opportunities are the smartest to fund. You use Spotfire to mark a few of the BlitzPort portfolios that best meet your goals and resource limits. The BlitzPort Census tool will read which portfolios you marked in the Spotfire (yellow point in the right hand chart) and prepare a list of the Opportunities funded. The Census report of funded opportunities is arranged with opportunities in rows and each selected portfolio arranged in columns. The number for an opportunity row and portfolio column is the Cumulative Capex at which the opportunity got funded in that portfolio. Lower numbers mean the project was funded early and is a stronger pick. Census sorts the rows first by the number of portfolios that funded the opportunity, second by the average capex level where the opportunity was funded. The top of the list shows opportunities funded in the most portfolios and funded earliest in the list. Because Census reports the Opportunities in an order of "decreasing strength", the Census gives managers an immediate feel for which are the strongest opportunities (at the top) and the weakest ones funded at all at the bottom. Should there be a capex reduction, the opportunities listed at the bottom of the Census should be the first to be cut. 2Woolsey's Second Law: "A manager does not want and will not pay for an Optimum Solution. He wants to be better off as quickly and as cheaply as possible." - Dr. Gene Woolsey, Colorado School of Mines, Operations Research for Immediate Applications, 1977 ."